Nimmanhemin is an area in Chiang Mai well known for its modern restaurants, arty atmosphere and a thousand and three coffee shops. With so much choice, finding the best is no easy mission. We have been to most coffee shops in Nimman. Chain or independent, we give every place a try. Many places are too expensive, too boring, too small, too laptop unfriendly... the list goes on. Pai Yan Yai is one of the best. It opens from 8am to 8pm and offers an insulated little world of creative coffees, free WiFi, plenty of plug holes, air conditioning and teddy bears. It's one of our favourite coffee shops in Nimman. 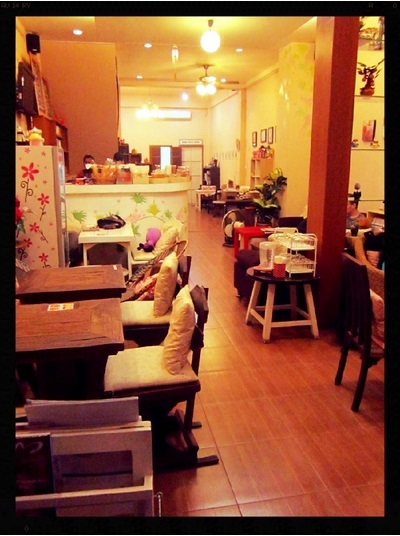 #1 It has the most creative coffee menu in Nimman*. Drinking a peppermint cappuccino frappe from Pai Yan Yai increases my productivity by at least eighty seven percent. 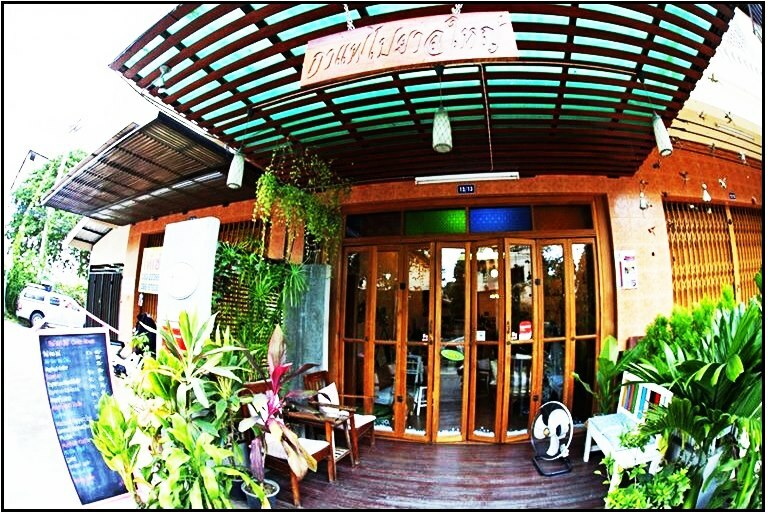 You can try mocha macadamia, English toffee latte or americano soda, all for around 70 baht. All the drinks we've had are big. I'd recommend Pai Yan Yai Chic frappe. They also do cakes and bakery things, including cherry pie, so Andy can eat it and say "that's some damn fine cherry pie", just like Agent Cooper from Twin Peaks. *excluding perhaps Ristr8to, but... expensive. #2 You can always find a place to sit. Pai Yan Yai is pretty big and has two floors. You can choose from sinky sofas, wicker chairs, wooden chairs and more, all with squishy cushions. #3 It has decent free WiFi and plenty of plug holes. I've really gotten into working at a coffee shop rather than at home. I think a change of scenery can really boost creativity and I know I produce better work. When your computer needs more juice, a useable plug socket is important. I absolutely do not want to pay to use a plug socket (more common in Nimman than I can believe), and I don't want to have to go home to charge up when I'm in the middle of making a brilliant worksheet. I don't want to have to move from my seat to plug in, either. A round of appreciative applause please for Pai Yan Yai's free WiFi and unlimited handily located plug socket use! #4 I love the quirky decor. When I finally have my dream house one day (a Northern Thai tree house), I want my living room to look a bit like this. It's colourful and fresh, it has good photographs on the wall of places and cats and there are soft toys scattered everywhere (which sounds a little weird, I admit, but it totally works). #5 The staff are friendly. I hate mardy staff. When I'm eating or drinking somewhere I don't want to be glared at. When I ask for the bill, I don't want to hear a sigh. Likewise, I don't really like over-the-top staff. I don't want my chair pulled out for me, or to have a napkin placed across my lap. I do want smiles, helpfulness and genuine interactions. Yay for Pai Yan Yai's friendly staff!